Radiograph of a horse hoof showing rotation of the coffin bone and evidence of sinking, a condition often associated with laminitis. The annotation P2 stands for the middle phalanx, or pastern bone, and P3 denotes the distal phalanx, or coffin bone. The yellow lines mark the distance between the top and bottom part of the coffin bone relative to the hoof wall, showing the distal (bottom) of the coffin bone is rotated away from the hoof wall. Laminitis is a disease that affects the feet of ungulates and is found mostly in horses and cattle. Clinical signs include foot tenderness progressing to inability to walk, increased digital pulses, and increased temperature in the hooves. Severe cases with outwardly visible clinical signs are known by the colloquial term founder , and progression of the disease will lead to perforation of the coffin bone through the sole of the hoof or being unable to stand up requiring euthanasia. Animal euthanasia is the act of putting an animal to death or allowing it to die by withholding extreme medical measures. Reasons for euthanasia include incurable conditions or diseases, lack of resources to continue supporting the animal, or laboratory test procedures. Euthanasia methods are designed to cause minimal pain and distress. Euthanasia is distinct from animal slaughter and pest control although in some cases the procedure is the same. Informal use of the word "founder"
In zoology, the epidermis is an epithelium that covers the body of a eumetazoan. Eumetazoa have a cavity lined with a similar epithelium, the gastrodermis, which forms a boundary with the epidermis at the mouth. The coffin bone, also known as the pedal bone (U.S.), is the bottommost bone in the front and rear legs of horses, cattle, pigs and other ruminants. In horses it is encased by the hoof capsule. Also known as the distal phalanx, third phalanx, or "P3". The coffin bone meets the short pastern bone or second phalanx at the coffin joint. The coffin bone is connected to the inner wall of the horse hoof by a structure called the laminar layer. The insensitive laminae coming in from the hoof wall connects to the sensitive laminae layer, containing the blood supply and nerves, which is attached to the coffin bone. The lamina is a critical structure for hoof health, therefore any injury to the hoof or its support system can in turn affect the coffin bone. Hemidesmosomes are very small stud-like structures found in keratinocytes of the epidermis of skin that attach to the extracellular matrix. They are similar in form to desmosomes when visualized by electron microscopy, however, desmosomes attach to adjacent cells. Hemidesmosomes are also comparable to focal adhesions, as they both attach cells to the extracellular matrix. Instead of desmogleins and desmocollins in the extracellular space, hemidesmosomes utilize integrins. Hemidesmosomes are found in epithelial cells connecting the basal epithelial cells to the lamina lucida, which is part of the basal lamina. Hemidesmosomes are also involved in signaling pathways, such as keratinocyte migration or carcinoma cell intrusion. Inflammatory events that are associated with laminitis include sepsis, endotoxemia, retained placenta, carbohydrate overload (excessive grain or pasture), enterocolitis, pleuropneumonia, and contact with black walnut shavings. In these cases, there is an increase in blood flow to the hoof, bringing in damaging substances and inflammatory cells into the hoof. The placenta is a temporary organ that connects the developing fetus via the umbilical cord to the uterine wall to allow nutrient uptake, thermo-regulation, waste elimination, and gas exchange via the mother's blood supply; to fight against internal infection; and to produce hormones which support pregnancy. Placentas are a defining characteristic of placental mammals, but are also found in marsupials and some non-mammals with varying levels of development. A carbohydrate is a biomolecule consisting of carbon (C), hydrogen (H) and oxygen (O) atoms, usually with a hydrogen–oxygen atom ratio of 2:1 (as in water) and thus with the empirical formula Cm(H2O)n (where m may be different from n). This formula holds true for monosaccharides. Some exceptions exist; for example, deoxyribose, a sugar component of DNA, has the empirical formula C5H10O4. The carbohydrates are technically hydrates of carbon; structurally it is more accurate to view them as aldoses and ketoses. Pituitary pars intermedia dysfunction (PPID), or equine Cushing's disease, is an endocrine disease affecting the pituitary gland of horses. It is most commonly seen in older animals, and is classically associated with the formation of a long, wavy coat (hirsutism) and chronic laminitis. Equine metabolic syndrome (EMS), is an endocrinopathy affecting horses and ponies. It is of primary concern due to its link to obesity, insulin resistance, and subsequent laminitis. There are some similarities in clinical signs between EMS and pituitary pars intermedia dysfunction, also known as PPID or Cushing's disease, and some equines may develop both, but they are not the same condition, having different causes and different treatment. Hoof sagittal section with massive inflammation and rotation of third phalanx. Normally, the front of the third phalanx is parallel to the hoof wall and its lower surface should be roughly parallel to the ground surface. A single severe laminitic episode or repeated, less severe episodes can, depending upon the degree of separation of dermal and epidermal laminae, lead to either rotation or sinking of the pedal bone, both of which result in anatomical changes in the position of the coffin bone with visible separation of the laminae, colloquially known as founder. Rotation and distal displacement may occur in the same horse. Both forms of displacement may lead to the coffin bone penetrating the sole. Penetration of the sole is not inherently fatal; many horses have been returned to service by aggressive treatment by a veterinarian and farrier, but the treatment is time-consuming, difficult and expensive. Rotation is the most common form of displacement, and, in this case, the tip of the coffin bone rotates downward. The degree of rotation may be influenced by the severity of the initial attack and the time of initiation and aggressiveness of treatment. A combination of forces (e.g. the tension of the deep digital flexor tendon and the weight of the horse) result in the deep digital flexor tendon literally pulling the dorsal face of the coffin bone away from the inside of the hoof wall, which allows the coffin bone to rotate. Also, ligaments attaching the collateral cartilages to the digit, primarily in the palmar portion of the foot, possibly contribute to a difference in support from front to back. The body weight of the animal probably contributes to rotation of the coffin bone. Rotation results in an obvious misalignment between PII (the short pastern bone) and PIII (the coffin bone). If rotation of the third phalanx continues, its tip can eventually penetrate the sole of the foot. Sinking is less common and much more severe. It results when a significant failure of the interdigitation between the sensitive and insensitive laminae around a significant portion of the hoof occurs. The destruction of the sensitive laminae results in the hoof wall becoming separated from the rest of the hoof, so that it drops within the hoof capsule. Sinking may be symmetrical, i.e., the entire bone moves distally, or asymmetric, where the lateral or medial aspect of the bone displaces distally. Pus may leak out at the white line or at the coronary band. In extreme cases, this event allows the tip to eventually penetrate the sole of the foot. A severe "sinker" usually warrants the gravest prognosis and may, depending upon many factors, including the quality of aftercare, age of the horse, diet and nutrition, skill, and knowledge and ability of the attending veterinarian and farrier(s), lead to euthanasia of the patient. Treatment and prognosis depend on the phase of the disease, with horses treated in earlier stages often having a better prognosis. Hoof specimen, sagittal section. Severe P3 rotation and penetration into the sole. A lamellar wedge is evident. Laminitis has multiple causes, some of which commonly occur together. These causes can be grouped into broad categories. Carbohydrate overload: One of the more common causes, current theory states[ citation needed ] that if a horse is given grain in excess or eats grass under stress and has accumulated excess nonstructural carbohydrates (sugars, starch, or fructan), it may be unable to digest all of the carbohydrate in the foregut. The excess then moves on to the hindgut and ferments in the cecum. The presence of this fermenting carbohydrate in the cecum causes proliferation of lactic acid bacteria and an increase in acidity. This process kills beneficial bacteria, which ferment fiber. The endotoxins and exotoxins may then be absorbed into the bloodstream, due to increased gut permeability, caused by irritation of the gut lining by increased acidity. The result is body-wide inflammation, but particularly in the laminae of the feet, where swelling tissues have no place to expand without injury to other structures. This results in laminitis. Nitrogen compound overload: Herbivores are equipped to deal with a normal level of potentially toxic nonprotein nitrogen compounds in their forage. If, for any reason, rapid increases in levels of these compounds occur, for instance in lush spring growth on fertilized lowland pasture, the natural metabolic processes can become overloaded, resulting in liver disturbance and toxic imbalance. For this reason, many avoid using synthetic nitrogen fertilizer on horse pasture. If clover (or any legume) is allowed to dominate the pasture, this may also allow excess nitrogen to accumulate in forage, under stressful conditions such as frost or drought. Many weeds eaten by horses are nitrate accumulators. Direct ingestion of nitrate fertilizer material can also trigger laminitis, by a similar mechanism. Lush pastures: When releasing horses back into a pasture after being kept inside (typically during the transition from winter stabling to spring outdoor keeping), the excess fructan of fresh spring grass can lead to a bout of laminitis. Ponies and other easy keepers are much more susceptible to this form of laminitis than are larger horses. Frosted grass: Freezing temperatures in the fall also coincide with outbreaks of laminitis in horses at pasture. Lower temperatures cause growth to cease, so sugar in pasture grasses cannot be used by the plant as fast as it is produced, thus they accumulate in the forage. Cool-season grasses form fructan, and warm season grasses form starch. Sugars cause increases in insulin levels, which are known to trigger laminitis. Fructan is theorized to cause laminitis by causing an imbalance of the normal bowel flora leading to endotoxin production. These endotoxins may exacerbate insulin resistance, or the damage to the lining of the gut may release other as yet unidentified trigger factors into the blood stream. For horses prone to laminitis, restrict or avoid grazing when night temperatures are below 40 °F (5 °C) followed by sunny days. When growth resumes during warmer weather, sugar will be used to form protein and fiber and will not accumulate. Untreated infections: Systemic infections, particularly those caused by bacteria, can cause release of endotoxins into the blood stream. A retained placenta in a mare (see below) is a notorious cause of laminitis and founder. Insulin resistance: Laminitis can also be caused by insulin resistance in the horse. Insulin-resistant horses tend to become obese very easily and, even when starved down, may have abnormal fat deposits in the neck, shoulders, loin, above the eyes, and around the tail head, even when the rest of the body appears to be in normal condition. The mechanism by which laminitis associated with insulin resistance occurs is not understood, but may be triggered by sugar and starch in the diet of susceptible individuals. 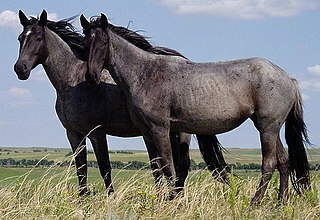 Ponies and breeds that evolved in relatively harsh environments, with only sparse grass, tend to be more insulin-resistant, possibly as a survival mechanism. Insulin-resistant animals may become laminitic from only very small amounts of grain or "high sugar" grass. Slow adaptation to pasture is not effective, as it is with laminitis caused by microbial population upsets. Insulin-resistant horses with laminitis must be removed from all green grass and be fed only hay tested for nonstructural carbohydrates (sugar, starch and fructan) and found to be below 11% on a dry-matter basis. Pituitary pars intermedia dysfunction, or Cushing's disease, is common in older horses and ponies and causes an increased predisposition to laminitis. Equine metabolic syndrome is a subject of much new research and is increasingly believed to have a major role in laminitis. It involves many factors such as cortisol metabolism and insulin resistance. It has some similarities to type II diabetes in humans. In this syndrome, peripheral fat cells synthesise adipokines which are analogous to cortisol, resulting in Cushings-like symptoms. A retained placenta, if not passed completely after the birth of a foal, can cause mares to founder, whether through toxicity, bacterial fever, or both. Even horses not considered to be susceptible to laminitis can become laminitic when exposed to certain agrichemicals. The most commonly experienced examples are certain herbicides and synthetic nitrate fertilizer. Early diagnosis is essential to effective treatment. However, early outward signs may be fairly nonspecific. Careful physical examination typically is diagnostic, but radiographs are also very useful. Cross-section of horse with severe laminitis, showing a dished dorsal hoof wall that grows in a more horizontal manner, and a sole that is convex due to pressure from the tip of P3 secondary to rotation. The horse stands in a "founder stance" in attempt to decrease the load on the affected feet. If it has laminitis in the front hooves, it will bring its hind legs underneath its body and put its fore legs out in front. In cases of sinking, the horse stands with all four feet close together, like a circus elephant. Obel grade 1: Horse shifts weight between affected feet or continuously lifts feet up. It is sound at the walk but displays a shortened stride at the trot. Obel grade 2: Horse displays a stilted, stiff gait, although is willing to walk. It is possible to easily lift a front foot and have the horse take all of its weight on the contralateral limb. Obel grade 3: Horse displays a stilted, stiff gait, but is reluctant to walk and is difficult when asked to lift a front foot. Obel grade 4: Horse is very reluctant to move, or is recumbent. Several radiographic measurements, made on the lateral view, allow for objective evaluation of the episode. Sole depth (SD): the distance from the tip of P3 to the ground. Palmar angle (PA): the angle between a line perpendicular to the ground, and a line at the angle of the palmar surface of P3. The sooner the diagnosis is made, the faster the treatment and the recovery process can begin. Rapid diagnosis of laminitis is often difficult, since the general problem often starts somewhere else in the horse's body. With modern therapies, most laminitics will be able to bear a rider or completely recover, if treated quickly, and if the laminitis was not severe or complicated (e.g. by equine metabolic syndrome or Cushing's disease). Even in these cases, a clinical cure can often be achieved. Endotoxic laminitis (e.g. after foaling) tends to be more difficult to treat. Successful treatment requires a competent farrier and veterinarian, and success is not guaranteed. A horse can live with laminitis for many years, and although a single episode of laminitis predisposes to further episodes, with good management and prompt treatment it is by no means the catastrophe sometimes supposed: most horses suffering an acute episode without pedal bone displacement make a complete functional recovery. Some countermeasures can be adopted for pasture based animals. Discovery of laminitis, either active or relatively stabilized, on an equine prepurchase exam typically downgrades the horse's value, as the possibility of recurrence is a significant risk factor for the future performance of the horse. Besides pain management and control of any predisposing factors, mechanical stabilization is a primary treatment goal once the initial inflammatory and metabolic issues have resolved. No approach has been shown to be effective in all situations, and debate is ongoing the merits and faults of the numerous techniques. Once the distal phalanx rotates, it is essential to derotate and re-establish its proper spatial orientation within the hoof capsule, to ensure the best long-term prospects for the horse. With correct trimming and, as necessary, the application of orthotics, one can effect this reorientation. However, this is not always completely effective. The application of external orthotic devices to the foot in a horse with undisplaced laminitis and once displacement has occurred is widespread. Most approaches attempt to shift weight away from the laminae and onto secondary weight-bearing structures, while sparing the sole. Corrective hoof trimming will restore proper hoof form and function. Corrective trimming will allow the hooves to be healthy again. Realigning trimming trims back the toe so that it is in line with the coffin bone. Realigning trimming pushes the coffin bone back into the correct position. The process of a new hoof capsule totally growing out to replace the old one takes up to a year. Informally, particularly in the United States, "founder" has come to mean any chronic changes in the structure of the foot that can be linked to laminitis. In some texts, the term is even used synonymously with laminitis, though such usage is technically incorrect. Put simply, not all horses that experience laminitis will founder, but all horses that founder will first experience laminitis. A hoof, plural hooves or hoofs, is the tip of a toe of an ungulate mammal, strengthened by a thick, horny, keratin covering. The navicular bone is a small bone found in the feet of most mammals. Navicular syndrome, often called navicular disease, is a syndrome of lameness problems in horses. It most commonly describes an inflammation or degeneration of the navicular bone and its surrounding tissues, usually on the front feet. It can lead to significant and even disabling lameness. Ringbone is exostosis in the pastern or coffin joint of a horse. In severe cases, the growth can encircle the bones, giving ringbone its name. It has been suggested by some authors that such a colloquial term, whilst commonly used, might be misleading and that it would be better to refer to this condition as osteoarthritis of the inter-phalangeal joints in ungulates. Sidebone is a common condition of horses, characterized by the ossification of the collateral cartilages of the coffin bone. These are found on either side of the foot protruding above the level of the coronary band. The lateral cartilages support the hoof wall and provide an important role in the support and cushioning provided to the heel. The front feet are most commonly affected. There are many aspects to horse care. Horses, ponies, mules, donkeys and other domesticated equids require attention from humans for optimal health and long life. The frog is a part of a horse's hoof, located on the underside, which should touch the ground if the horse is standing on soft footing. The frog is triangular in shape, and extends mid way from the heels toward the toe, covering around 25% of the bottom of the hoof. Barbaro was an American Thoroughbred racehorse who decisively won the 2006 Kentucky Derby, but shattered his leg two weeks later in the 2006 Preakness Stakes, which ended his racing career and eventually led to his death. A horse hoof is a structure surrounding the distal phalanx of the 3rd digit of each of the four limbs of Equus species, which is covered by complex soft tissue and keratinised (cornified) structures. Since a single digit must bear the full proportion of the animal's weight that is borne by that limb, the hoof is of vital importance to the horse. The phrase "no hoof, no horse" underlines how much the health and the strength of the hoof is crucial for horse soundness. A hoof boot is a device made primarily of polyurethane and is designed to cover the hooves of a horse as an alternative to, and occasionally in addition to, horseshoes. Hoof boots can also be used as a protective device when the animal has a hoof injury that requires protection of the sole of the hoof, or to aid in the application of medication. There are many different designs, but all have the goal of protecting the hoof wall and sole of the horse's hoof from hard surfaces, rocks and other difficult terrain. Equine podiatry is the study and management of the equine foot based on its anatomy and function. Lameness is an abnormal gait or stance of an animal that is the result of dysfunction of the locomotor system. In the horse, it is most commonly caused by pain, but can be due to neurologic or mechanical dysfunction. Lameness is a common veterinary problem in racehorses, sport horses, and pleasure horses. It is one of the most costly health problems for the equine industry, both monetarily for the cost of diagnosis and treatment, and for the cost of time off resulting in loss-of-use. Nail prick or quicking occurs in a horse if the sensitive hoof structures are penetrated by a horseshoe nail being driven through the hoof wall while shoeing. The nail creates a wound on the inside of the hoof wall. Quittor is an infection of the lower leg of equines, sometimes known as graveling. A condition once common in draft horses, it is characterized by inflammation of the cartilage of the lower leg. There are two forms, subcutaneous and cartilaginous. Quittor usually results from an injury to the leg, such as an abscess on the coronary band above the hoof, that allows foreign matter to get into the leg and then collect beneath the hoof, leading to an infection. In some cases, removing this matter requires cutting away parts of the hoof. Abscesses may also form inside the hoof capsule itself from improper shoeing and trimming of the hoof, from laminitis, or from injury to the sole of the hoof, but the horse will be significantly lame for a longer period of time if the infection migrates up to the coronary band rather than down. Treatment of hoof and coronary band abscesses today usually incorporates use of antibiotics, sometimes combined with poulticing. Natural hoof care is the practice of keeping horses so that their hooves are worn down naturally and so do not suffer overgrowth, splitting and other disorders. Horseshoes are not used, but domesticated horses may still require trimming, exercise and other measures to maintain a natural shape and degree of wear. The limbs of the horse are structures made of dozens of bones, joints, muscles, tendons and ligaments that support the weight of the equine body. They include two apparatuses: the suspensory apparatus, which carries much of the weight, prevents overextension of the joint and absorbs shock, and the stay apparatus, which locks major joints in the limbs, allowing horses to remain standing while relaxed or asleep. The limbs play a major part in the movement of the horse, with the legs performing the functions of absorbing impact, bearing weight, and providing thrust. In general, the majority of the weight is borne by the front legs, while the rear legs provide propulsion. The hooves are also important structures, providing support, traction and shock absorption, and containing structures which provide blood flow through the lower leg. As the horse developed as a cursorial animal, with a primary defense mechanism of running over hard ground, its legs evolved to the long, sturdy, light-weight, one-toed form seen today. The treatment of equine lameness is a complex subject. Lameness in horses has a variety of causes, and treatment must be tailored to the type and degree of injury, as well as the financial capabilities of the owner. Treatment may be applied locally, systemically, or intralesionally, and the strategy for treatment may change as healing progresses. The end goal is to reduce the pain and inflammation associated with injury, to encourage the injured tissue to heal with normal structure and function, and to ultimately return the horse to the highest level of performance possible following recovery. 1 2 3 4 5 6 7 8 9 10 11 12 13 14 15 16 17 18 19 20 21 22 23 24 25 26 27 28 29 30 31 32 33 34 35 36 37 38 Orsini J, Divers T (2014). Equine Emergencies (4th ed.). St. Louis, MO: Elsevier. pp. 697–712. ISBN 978-1-4557-0892-5. ↑ Pollitt CC (1995). Color Atlas of the Horse's Foot. Mosby. ISBN 978-0-7234-1765-1. ↑ Loftus JP, Black SJ, Pettigrew A, Abrahamsen EJ, Belknap JK (November 2007). "Early laminar events involving endothelial activation in horses with black walnut- induced laminitis". American Journal of Veterinary Research. 68 (11): 1205–11. doi:10.2460/ajvr.68.11.1205. PMID 17975975. 1 2 3 4 5 6 7 8 9 10 11 12 13 14 15 16 17 18 19 20 21 22 23 24 25 26 27 28 Baxter G (2011). Manual of Equine Lameness (1st ed.). Ames, Iowa: Wiley-Blackwell. pp. 257–262. ISBN 978-0-8138-1546-6. 1 2 3 4 5 6 7 8 Huntington P, Pollitt C, McGowan C (September 2009). "Recent research into laminitis" (PDF). Advances in Equine Nutrition. IV: 293. Archived from the original (PDF) on 23 March 2013. Retrieved 28 July 2014. ↑ de Laat MA, Kyaw-Tanner MT, Nourian AR, McGowan CM, Sillence MN, Pollitt CC (April 2011). "The developmental and acute phases of insulin-induced laminitis involve minimal metalloproteinase activity". Veterinary Immunology and Immunopathology. 140 (3–4): 275–81. doi:10.1016/j.vetimm.2011.01.013. PMID 21333362. ↑ Watts KA (March 2004). "Forage and Pasture Management for Laminitic Horses" (PDF). Clinical Techniques in Equine Practice. 3 (1): 88–95. Archived (PDF) from the original on 2010-12-31. Retrieved 2010-04-22. ↑ Nilsson SA (1963). "Clinical, morphological and experimental studies of laminitis in cattle". Acta Veterinaria Scandinavica. 4 (Suppl. 1): 188–222. OCLC 13816616. ↑ Takahashi K, Young BA (June 1981). "Effects of grain overfeeding and histamine injection on physiological responses related to acute bovine laminitis". Nihon Juigaku Zasshi. The Japanese Journal of Veterinary Science. 43 (3): 375–85. doi:10.1292/jvms1939.43.375. PMID 7321364. ↑ Thoefner MB, Pollitt CC, Van Eps AW, Milinovich GJ, Trott DJ, Wattle O, Andersen PH (September 2004). "Acute bovine laminitis: a new induction model using alimentary oligofructose overload". Journal of Dairy Science. 87 (9): 2932–40. doi:10.3168/jds.s0022-0302(04)73424-4. PMID 15375054. 1 2 3 Rooney J. "Nonclassical laminitis". Archived from the original on 2008-01-24. ↑ "Transcript of Press Conference on the condition of Barbaro" (PDF). University of Pennsylvania School of Veterinary Medicine. 13 July 2006. Archived from the original (PDF) on 4 February 2007. ↑ "Clinical use of triamcinolone acetonide in the horse (205 cases) and the incidence of glucocorticoid‐induced laminitis associated with its use". ↑ "No Evidence That Therapeutic Systemic Corticosteroid Administration is Associated With Laminitis in Adult Horses Without Underlying Endocrine or Severe Systemic Disease". ↑ Luthersson N, Mannfalk M, Parkin TD, Harris P (2017). "Laminitis: Risk Factors and Outcome in a Group of Danish Horses". Journal of Equine Veterinary Science. 53: 68–73. doi:10.1016/j.jevs.2016.03.006. ↑ Menzies-Gow NJ, Harris PA, Elliott J (May 2017). "Prospective cohort study evaluating risk factors for the development of pasture-associated laminitis in the United Kingdom". Equine Veterinary Journal. 49 (3): 300–306. doi:10.1111/evj.12606. PMID 27363591. ↑ Anderson M. "The Obel Grading System for Describing Laminitis". www.thehorse.com. The Horse. Archived from the original on 15 August 2014. Retrieved 30 July 2014. 1 2 Ramey P, Bowker RM (2011). Care and Rehabilitation of the Equine Foot. Hoof Rehabilitation Publisher. pp. 234–253. ISBN 978-0-615-52453-5. ↑ Wongaumnuaykul S, Siedler C, Schobesberger H, Stanek C (2006). "Doppler sonographic evaluation of the digital blood flow in horses with laminitis or septic pododermatitis". Veterinary Radiology & Ultrasound. 47 (2): 199–205. doi:10.1111/j.1740-8261.2006.00128.x. PMID 16553154. ↑ Harris P, Bailey SR, Elliott J, Longland A (July 2006). "Countermeasures for pasture-associated laminitis in ponies and horses". The Journal of Nutrition. 136 (7 Suppl): 2114S–2121S. doi:10.1093/jn/136.7.2114S. PMID 16772514. ↑ Colahan P, Merritt A, Moore J, Mayhew I (December 1998). Equine Medicine and Surgery (Fifth ed.). Mosby. p. 408. ISBN 978-0-8151-1743-8. ↑ Pollitt C (November 2003). "Equine Laminitis" (PDF). Proceedings of the AAEP. 49. Archived (PDF) from the original on 2008-03-08. Retrieved 2008-04-19. ↑ Shulman L. "Making of a Miracle" (PDF). vet.osu.edu (reprint from The Blood-Horse). Archived (PDF) from the original on 17 December 2016. Retrieved 20 March 2017. ↑ MacAllister CG, Morgan SJ, Borne AT, Pollet RA (January 1993). "Comparison of adverse effects of phenylbutazone, flunixin meglumine, and ketoprofen in horses". Journal of the American Veterinary Medical Association. 202 (1): 71–7. PMID 8420909. ↑ Sabaté D, Homedes J, Mayós I, Calonge R, et al. (January 2005). Suxibuzone as a Therapeutical Alternative to Phenylbutazone in the Treatment of Lameness in Horses (PDF). 11th SIVE Congress. Pisa. Archived (PDF) from the original on 2005-05-29. Retrieved 2008-04-19. ↑ Doucet MY, Bertone AL, Hendrickson D, Hughes F, Macallister C, McClure S, et al. (January 2008). "Comparison of efficacy and safety of paste formulations of firocoxib and phenylbutazone in horses with naturally occurring osteoarthritis". Journal of the American Veterinary Medical Association. 232 (1): 91–7. doi:10.2460/javma.232.1.91. PMID 18167116. ↑ Pollitt CC (2003). "Medical Therapy of Laminitis". In Ross MW, Dyson SJ. Diagnosis and Management of Lameness in the Horse. St. Louis, MO: Saunders. p. 330. ISBN 0-7216-8342-8. ↑ Adair HS, Schmidhammer JL, Goble DO, et al. (1997). "Effects of acepromazine maleate, isoxsuprine hydrochloride and prazosin hydrochloride on laminar blood flow in healthy horses". Journal of Equine Veterinary Science. 17: 599–603. doi:10.1016/S0737-0806(97)80186-4. ↑ Belknap JK, Black SJ (2005). "Review of the Pathophysiology of the Developmental Stages of Equine Laminitis". Proceedings American Association of Equine Practitioners. 51. ↑ Eustace RA (1996). Explaining Laminitis and its Prevention. Cherokee, Ala.: Life Data Labs. pp. 29–31. ISBN 978-0-9518974-0-9. ↑ Eastman TG, Honnas CM, Hague BA, Moyer W, von der Rosen HD (February 1999). "Deep digital flexor tenotomy as a treatment for chronic laminitis in horses: 35 cases (1988-1997)" (PDF). Journal of the American Veterinary Medical Association. 214 (4): 517–9. PMID 10029854. ↑ Carter DW, Renfroe JB (July 2009). "A novel approach to the treatment and prevention of laminitis: botulinum toxin type A for the treatment of laminitis". Journal of equine veterinary science. 29 (7): 595–600. Baxter GM, ed. (March 2011). Adams and Stashak's Lameness in Horses (6th ed.). Wiley-Blackwell. ISBN 978-0-813-81549-7. Rooney JR (1998). The Lame Horse. Russell Meerdink Company. ISBN 978-0-929346-55-7. Wagoner DM (ed.). The Illustrated Veterinary Encyclopedia for Horsemen. Equine Research Inc. ISBN 978-0-935842-03-6. Adams HR, Chalkley LW, Buchanan TM, Wagoner DM, eds. (1977). Veterinary Medications and Treatments for Horsemen. Equine Research Inc. ISBN 978-0-935842-01-2. Giffin JM, Gore T (July 2008). Horse Owner's Veterinary Handbook (Third ed.). Howell Book House. ISBN 978-0-470-12679-0. Jackson J. Founder: Prevention & Cure the Natural Way. Star Ridge Company. ISBN 978-0-9658007-3-0. Strasser H (2003). Who's Afraid of Founder. Laminitis Demystified: Causes, Prevention and Holistic Rehabilitation. Sabine Kells. ISBN 978-0-9685988-4-9. Curtis S (June 2006). Corrective Farriery, a textbook of remedial horseshoeing. R & W Publications (Newmarket) Ltd. ISBN 978-1-899772-13-1. Butler D. The Principles of Horseshoeing II and The Principles of Horseshoeing III. ISBN 978-0-916992-26-2. Riegel RJ, Hakola SE (1999). Illustrated Atlas of Clinical Equine Anatomy and Common Disorders of the Horse. One. Equistar Publications. ASIN B000Z4DW38. Redden RF (Apr 15, 2004). "Understanding Laminitis". The Horse. Jackson J (2001). Founder: Prevention & Cure the Natural Way. Star Ridge Publishing. ISBN 978-0-9658007-3-0.